I’m always a little wary around power tools. It’s one of those things they drilled into our heads—no pun intended—in high-school woodworking, with grisly tales of things getting caught in spinning components that morbidly fascinated the adolescent, mostly-male class. And yet, even without the gruesome yarns of Mr Spada, there’s something uniquely horrifying about the potential intersection of flesh and industrial machinery; the sort designed to cut, heat, clamp, bend, and otherwise shape heavy-duty materials, highlighting the frailty of the human form compared to its own inventions. 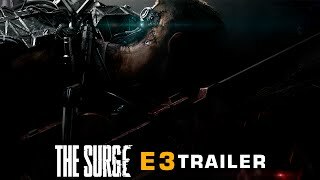 I can only assume The Surge, a somewhat gory sci-fi action-RPG about industrial workers in exosuits beating each other up with heavy-duty machinery, was conceived to play on that very particular fear. So here we are, slipping into the shoes of Warren, an engineer who I will resist calling “Blandy McGenericboots”, because he does in fact have one distinguishing feature: being a paraplegic. Yes, you start the game off in a wheelchair. Rather unfortunate, I know, but on the plus side, you’re on your way to work for CREO: an amoral megacorporation working to save the world from environmental disaster with the help of some really huge rockets. You can tell they’re amoral because they’re a megacorporation in the future and that’s what future megacorporations are like, but more importantly, because the first thing they do is strap you to a chair and surgically cyborg-ify you by grafting you to an exosuit—oh crikey, that looked painful—without your permission. Then they somehow let you wake up in a scrapyard with a load of robots and deranged murderous co-workers. Sure, you’re able to walk again—without the weeks to months of therapy it normally takes people, somehow—but that’s still a rough first day on the production line. When we last checked up on Deck13 Interactive, back in the halcyon days of 2014, they had heaved out Lords of the Fallen, a slightly derivative Souls-like that received what might be sensitively called a ‘mixed reception’. They could’ve gone back to making middleware adventure games, and I dare say it was probably on the cards for a while, but instead they persisted, and with The Surge it finally feels like they’ve found a distinct voice. Yes, its influences still stand out like Smough at a summer soiree—the methodical, weighty combat, the exploration through vast interlocking levels, the punishing learning process, and innumerable other little pilfered FromSoftware touches—but the formula feels like an honest framework for fresh ideas, rather than a crutch to desperately lean on. For instance, there’s very little traditional levelling up, at least in the ‘spend five minutes agonising over whether to put a point into Endurance or Vitality’ sense. Choosing to level up by spending ‘tech scraps’ at an ‘Operations bunker’—find and replace where appropriate, Souls fans—does nothing except increase your core power level, an integer value that determines how much equipment you can clip to your exosuit at once. Everything you can equip has a power drain, and if the sum of all the drainage is greater than your power level then… well, you’re out of luck. In some ways, this makes you exceedingly flexible; there’s no, say, health stat to pour points into, just health implants that you can put on like a stylish hat, if you feel a particular enemy hits too hard. It’s possible to swap in implants for regeneration, or stamina, or all sorts of useful little perks, so as long as you’ve amassed a decent selection, you can be very adaptive indeed. On the other hand, this means that you can only really invest in equipment, so if you feel your current collection of health implants isn’t quite cutting it—or you’re not swinging quite as hard as you’d like with your best weapon, or you’re taking too much punishment in your best armour—then you’re backed into a corner, and all the tech scrap in the world won’t help you. You don’t so much build a character as assemble a loadout, and while a loadout can certainly be more easily reconfigured, it also hits a lot more barriers. In any case, sooner or later you’ll have to put that loadout to work. There’s a satisfying sense of weight to the animations that really helps to sell the spectacle of augmented superhumans swinging around half-ton bits of machinery, and when you do inevitably clash, the feedback on hits is as clear as it is resoundingly meaty. Each weapon move-set has a diverse range of attacks—weak and strong, horizontal and vertical, continuous and delayed, dodging strikes, sliding strikes, jumping strikes—and it’s often possible to chain them together in creative ways, if you know what you’re doing. You’re also surprisingly nimble for a man wearing half a McDonalds’ playground climbing frame; the dodge is more of a deft Bloodborne-style dash than a lumbering Dark Souls roll, and you can hop or duck to evade certain attacks by tilting the thumbstick while blocking—though admittedly I never really found myself making use of it. The only major gripe I have is that there are only really a few distinct move-sets, shared between a pretty meagre selection of weapons, but then again, once you find one you like, there’s plenty of nuance to get stuck into. Getting hit is by no means a simple process either. Armour is a smidge more modular than the usual RPG fare—you can equip single arm and leg pieces independently—and there’s a certain degree of locational damage dictated by where blows initially impact. Everyone who’s trying to kill you is wearing an exosuit too—funny how that works, I wonder what the connection is—which means that parts of them will be better armoured than others, depending on what they’re equipped with. By prodding the right thumbstick around while locked on, you can influence where the damage from your attacks is directed, enabling you to, say, whale on somebody’s unprotected left arm in order to deal more damage and stagger them more easily. The flip-side is that damaging armoured parts increases the chance that they can be salvaged as schematics and crafting materials when you slice them off with a finishing move. If you can get past the psychotic, juvenile, gore-tastic spectacle of amputating someone’s leg in a slow-motion fountain of arterial fluid because you wanted their cyber-trousers—honestly, am I supposed to be in reverent awe of this?—it’s a solid way to tie together a number of systems into the decision-making process. Do I just want this enemy out of the way as quickly as possible? Do I want that armour piece, or am I low on crafting materials? Will they stagger from a glancing blow, or do I need every chance I can get to throw them off balance? What can I reliably hit with my preferred combo? Oh Christ, here they come. Whenever games with a vaguely Souls-y formula enter a conversation, of course, there’s always an elephant in the room: the question of “will this game kick sand in my eyes and steal my lunch money?” Failing forward is an integral part of the core loop, but difficulty comes in many forms, and using it to teach effectively is a tricky business. For the most part, The Surge is fair, if a bit needlessly punishing at times: you’ll rarely be caught out by a cheap trick, but even the most humdrum of enemies can kill you in one or two blows, which doesn’t leave you with a lot of room to make honest little mistakes. Speaking of mistakes, the absolute most frustrating part of the game was a boss that was invulnerable until I filled up a meaningless bar, removed certain armour plates—a mechanic that had hitherto not appeared anywhere else in the game—and punished it in the middle of a very particular attack. I had encountered a weaker version of the boss earlier in the game that was presumably meant to prepare me for this to some degree, but it was such a pushover that I defeated it without really understanding what was going on, which was about as satisfying as emptying out a box of chewing gum and gnawing on the cardboard instead. Highly questionable boss fight aside, failure is only to be expected, and in The Surge it comes with a certain unexpected challenge. Whenever you ‘die’—it’s not really dying, I suppose, but you know how these things are—you drop your tech scraps, and can only retrieve them by picking them up from the spot where your corpse fell. So far, so standard, but these dropped scraps are also on a timer that causes them to vanish into the ether if you don’t retrieve them in two and a half minutes, and this feels like a less-than ideal twist on the formula. It’s more nerve-wracking this way, of course, feeling yet another threat breathing down your neck, nipping at your heels as you try to keep up a brisk pace, but it also cripples the mechanic’s primary function as an incentive for consistency. “Hey, look,” says Dark Souls, dangling your souls in front of you tantalisingly. “If you can prove you can do that again, you can have these back.” So you take your time, learn enemies’ patterns, focus on not making mistakes, and come away having learned to cope with that particular stretch a whole lot better than if, say, you were panicking and trying to take it as fast as possible because of an arbitrary time limit. You are rewarded with bonus time for killing enemies, so it’s not necessarily just a desperate madcap sprint through the world, but it still feels like an inelegant way to up the stakes. Hmm, right, the world. If, like me, you get near-illegal levels of enjoyment out of unravelling an elegantly constructed space, then there’s a lot to appreciate about The Surge’s environments. Admittedly they’re divided into a discrete set of themed zones broken up by loading screens—the factory, the junkyard, the labs, that sort of thing—but each zone is large and well-constructed enough to stand on its own. One of the more interesting design decisions is that there’s only one Operations bunker—the place where you heal, level up, manage equipment, and respawn—per area; a steel container constantly playing the same acoustic guitar ditty over and over on its PA system, presumably to relax people in the med-bay when a robotic arm starts hammering cyber-nails into their sternum. Consequentially, the routes that you trace through the world inevitably loop back around, feeding into one another and revealing shortcuts until the whole zone is a tangle of crisscrossing ways to get from A to B. Not everything lines up neatly—you’ll spend far too much time tramping down featureless copy-pasted maintenance corridors that arbitrarily worm their way through the complex—but it’s still rife with moments of spatial clarity where you round a corner or open a door and go “oh, so that’s where this goes”. I do have one or two more serious level design issues, mind. Much like a Souls game—have you noticed a few parallels yet?—careful observation will often allow you to find hidden goodies if you’re willing to hop off gantries, shuffle along ledges or leap over railings, but often what looks like an artfully disguised secret can easily be a poorly signposted death pit, causing you to instantly perish from a two-foot fall onto an unmoving conveyer belt, or a concrete platform. At the far end of the scale, while the world does allow for a certain degree of exploration and backtracking, your overarching path through it is largely linear, without side-areas to provide slack. There’s only one way forward, so if you’re, say, stymied by a boss fight or a particularly rude encounter, there’s no Darkroot Garden to go a-wandering in while you cool your temper. Beat your head against this particular wall or turn off the game, buckaroo. On a different note, while The Surge does an acceptable job working with the greatest story archetype ever formulated—the kind where Science Goes Too Far And Now The Facility Is In Peril, So They Send In The Special Forces—it does have a bit of a strange tone problem. Between the game’s general insistence on keeping you in the dark—nobody you talk to for a very long time has the first idea what’s going on—and the various degrees to which areas of the CREO headquarters have been trashed, it takes a long time for it to decide how bad things are, and even when it does, it’s not very good at hammering it home. The lingering spectre of body horror appears on the periphery now and again, with allusions to thoughtless violations of flesh and bone wreaked upon the workers by a multinational corporation, but other than the very confronting intro cinematic the game doesn’t seem particularly interested in letting it have a non-trivial role, possibly because it would rain on your hacky slashy chainsaw dismemberment parade. Bits of the facility look like they were hit by a bomb, or airlifted from the USG Ishimura before anyone got a chance to scrub all the blood off the treadplates, but elsewhere you can find security guards just hanging out, barely a stone’s throw from a murderous axe man, telling you that the trains aren’t running and you should probably just move along. Just how buggered are we? Can I go home? Is anyone coming to help us? I have this flash drive here that’s supposed to be crucial to the survival of humanity, mind giving me a hand? Ahah-hah, sorry, no pun intended. We’ll get you a new one. Lastly, while there’s always a chance that it’ll have been resolved by the time it makes its way into your warm little mitts, right now The Surge is pretty blatantly missing a last-minute coat of polish. Most of it is skin-deep, thankfully—particle effects playing slowly or disappearing, lights flickering unnaturally, more clipping than a hair salon on the last day of the summer holidays—but once in a while the game would just skip over a dialogue line, or make an enemy into an untargetable ghost, which was a bit jarring to say the least. More serious were the crashes that turned up once in a while like unwelcome picnic guests, managing to not only send the game careening into a ditch—thankfully it autosaves every time you die—but also, on a couple of occasions, my graphics card drivers. Dark Souls and The Surge. The Surge and Dark Souls. How do you judge a game that exists wholly as a function of another game—one that is, itself, so impossible to unravel from its community, its critics, its multi-faceted appeal, and its divisiveness? 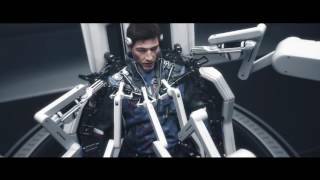 I could just put “The Surge is not as good as Dark Souls”, and it’d be my honest opinion: it’s not half as deep, or as wide, or as magical, or as exquisitely crafted. But what use is that, especially coming from a Souls fan? The reality is that I still had a jolly good time with The Surge, despite a few unusual design decisions, and a game that’s half as good as Dark Souls still deserves to hold its head high. Occasional clipping issues and a few nasty textures aside, the animations and sound are solid fare and several environments in particular have a nice sense of scale to them. Nice bold colours, too. Not all of its ideas quite pan out, but the combat is satisfying and fresh enough to distinguish itself. Exploration isn’t quite as open-ended as you might initially expect, but it still gives the spatial organisation bits of your brain a nice pleasant tickle. Caring about the non-character of Warren is nigh-impossible, and the game has a bit of a rough time asserting its tone, but the Souls-like cycle of failure and learning is as well-paced as ever. It doesn’t outstay its welcome either, which is a welcome sight in an RPG. Some serious crashes and not-so-serious visual bugs tarnish the game’s otherwise commendable performance, but with any luck they’ll be cleared up. Configuration options are unexpectedly impressive. 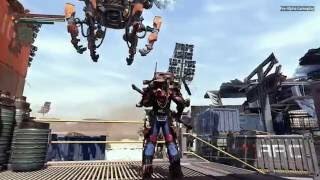 The Surge is a remarkably solid action-RPG that uses its premise to wedge a number of interesting design quirks into a familiar formula. Not terribly deep, but a wrench-swinging, robot-pulverizing good time nonetheless. The Surge is ranked #572 out of 1436 total reviewed games. It is ranked #49 out of 174 games reviewed in 2017.